Sometimes people aren't sure what the difference is between South and Central America—in other words, which countries are in which region. It's a common geographical mistake considering both regions are in Latin America. However, South and Central America are located on entirely different continents. Central America is actually part of North America, along with Canada, the United States, Mexico, and the Caribbean island countries. South America is a continent of its own. If you're planning a trip south of the border, study a map carefully before planning your itinerary. Native peoples like the Maya and the Olmec dominated the scene in pre-Columbian Central America. In the late 15th century, in the wake of Christopher Columbus's "discovery" of the Caribbean islands, the Spanish colonized the entire region. Their first settlement was in Panama in 1509, and in 1519 Pedro Arias de Avila began to explore to the north of Panama, into Central America. Herman Cortes continued the colonization in the 1520s and raided and occupied territory held for centuries by the Maya. The Spaniards brought disease, which decimated the population of the natives, and they also brought Catholicism, which replaced their religion. Spanish rule ended in September 1821, and that was briefly followed by a federation of the independent states of Central America patterned after the United States. But by 1840, this fell apart, and each became a sovereign nation. While there have been other attempts to unify the countries of Central America, none has been permanently successful, and all remain separate countries. The history of South America is similar to that of its neighbor to the north. There, the Inca ruled and prospered before the Spanish came in 1525 on an expedition from Panama led by Francisco Pizarro. As in Central America, the natives were decimated, Catholicism became the official religion, and the Spanish got rich on the continent's resources. South America was under Spanish rule for nearly 300 years before the drive for independence resulted in just that for all the colonies of Spanish South America by 1821. Brazil became independent from Portugal in 1822. Central America, part of the North American continent, is a 1,140-mile-long isthmus that connects Mexico to South America. It is bounded on the east by the Caribbean Sea and on the west by the Pacific Ocean, with no location more than 125 miles from the Caribbean or the Pacific. Lowlands, tropical rainforests, and swamps are near the coasts, but most of Central America is rolling and mountainous. It has volcanoes that sometimes violently erupt, and the region is extremely vulnerable to strong earthquakes. South America, the fourth largest continent in the world, is geographically diverse, with mountains, coastal plains, savannas, and river basins. It has the world's largest river (the Amazon) and the driest place in the world (the Atacama Desert). The Amazon Basin reaches out over 2.7 million square miles and is the largest watershed in the world. It's covered in tropical rainforest, while the Andes reach toward the sky and form the spine of the continent. South America is bordered on the east by the Atlantic Ocean, on the west by the Pacific, and on the north by the Caribbean Sea. The Atlantic and Pacific meet at the southern tip of South America. Central America begins its bridge from Mexico to South America in Guatemala and Belize and connects to South America where Panama touches Colombia. All are of Spanish heritage and Spanish-speaking except for Belize, which is an English-speaking country. South America, which is almost entirely in the Southern Hemisphere, includes 12 countries. Most are Spanish-speaking with a Spanish heritage. Brazil, which was settled by the Portuguese, is Portuguese-speaking. The locals in Guyana speak English, and Dutch is the official language of Suriname. French Guiana is not a country but rather an overseas department of France with a Creole vibe and miles of Atlantic coastline. Some of the top spots to visit in Central America are Tikal, Guatemala; the Hummingbird Highway in Belize; Panama City; and Monteverde and Santa Elena, Costa Rica. South America has an abundance of major tourist draws which include the Galapagos Islands; Rio de Janeiro; Cusco and Machu Picchu, Peru; Buenos Aires; and Cartagena and Bogota, Colombia. Seven countries make up Central America, which stretches from the southern border of Mexico to the northern tip of Brazil in South America. Belize: This English-speaking country located on the Caribbean coast is known for its large barrier reef and Mayan ruins. Costa Rica: Located between the Pacific and the Caribbean, Costa Rica's main draws are its beaches, volcanoes, and rainforested jungles. El Salvador: The smallest and most densely populated Central American country exports coffee, dishes up tasty pupusa, and has more than 20 volcanoes, some of them active. Guatemala: The ancient city of Tikal, a UNESCO World Heritage site, is one of the largest Mayan sites in Central America and features more than 3,000 temples, pyramids, and other structures. Honduras: The coral reefs in Honduras belong to the Mesoamerican Barrier Reef System, which is second in size only to Australia's Great Barrier Reef. Nicaragua: Central America's largest country is home to Granada, the oldest Spanish city in Central America. Panama: This country connects Central and South America and the impressive Panama Canal connects the Atlantic and Pacific oceans. South America stretches 6.89 million square miles and has 12 sovereign states. Argentina: Argentina, the world's eighth largest country, is where you'll find the Andes Mountains, tango music and dance, and the sophisticated capital of Buenos Aires. Bolivia: Bolivia contains the Amazon rainforest, Andes Mountains, and Lake Titicaca, which at 12,536 feet is the world's highest navigable lake. Brazil: Brazil is South and Central America's largest country and the world's fifth largest. 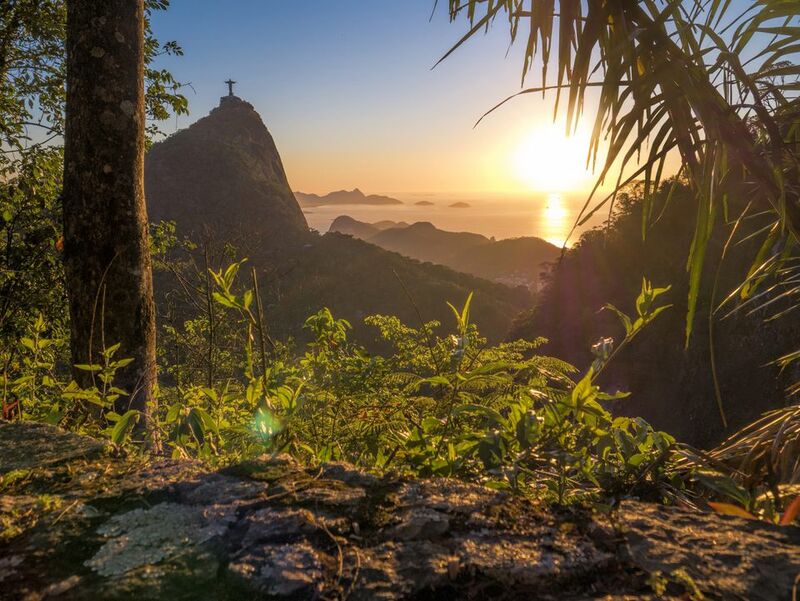 It's home to Rio de Janeiro's lively Carnaval festival, Copacabana and Ipanema beaches, and the statue of Jesus Christ on Mount Corcovado. Chile: In Chile, you'll find a long Pacific coastline, the Andes and Chilean Coast Range mountains, Easter Island, great wines, and the Atacama Desert, the world's driest place. Ecuador: Ecuador, located on the equator, is where you'll see Spanish colonial architecture, the Amazon jungle, Andes Mountains, and the abundant wildlife of the Galapagos Islands. Guyana: English-speaking Guyana shares a cultural heritage with the Caribbean and is covered by rainforest. Its capital city of Georgetown has beautiful Dutch colonial and British architecture. Paraguay: Paraguay, often called the "Heart of South America," is home to well-preserved Jesuit ruins, the vast and uninhabited Chaco plain region, and Iguacu Falls, which is taller and twice as wide as Niagara Falls. Peru: Peru is most famous for Machu Picchu and the Incan Trail, but it's also known for ceviche, a tasty dish of raw fish in a marinade of lime juice and chili peppers. Suriname: Once known as Dutch Guiana, Suriname is South America's smallest country and home to the St. Peter and Paul Cathedral Basilica, one of the largest wooden buildings in the world. Uruguay: Located on the Atlantic Ocean, Uruguay has beautiful beaches, including one where you'll find La Mano, a sculpture of a hand emerging from sand in the popular resort town of Punta del Este. Venezuela: Located on the Caribbean coast, Venezuela is home to many diverse national parks, including Canaima National Park, where you'll see Angel Falls, which at 3,208 feet high is the world's tallest uninterrupted waterfall.